Kunst 18 Zürich, 24th International Contemporary Art Fair is taking place in Zurich, on October 25 – 28, 2018. As every year, the leading fair in Zurich for contemporary arts takes place once again in the former ABB halls in Zurich Oerlikon. This year’s highlights include the special exhibition by Lucio Fontana curated by Galerie Imago, the joint concept of selected young galleries and a designer under the motto “Zurich Contemporary”, as well as a series of top-class panel discussions. Kunst Zürich is not only a leading trade fair for contemporary art, but also an important meeting-point for artists, gallery owners and art enthusiasts. Furthermore, the exhibition is an important platform for communication between galleries and public. Thus, Kunst Zürich continues to focus on discovering new names and talents. You will find a wide rage of contemporary visual arts, from classic forms, like paintings, photos and sculptures, and to the extraordinary installations. Dates: 25 – 28 of October, 2018. Location: ABB Hall 550, Birchstrasse 155, Zurich. How to get there: From the Zurich main train station the trains #9, 16, 24, 2, 14, 7, 15, 8, 6 till the stop Oerlikon. From the Stadelhofen train station the trains #15, 6, 9, 5, 16, 7, till the stop Oerlikon. Then walking from the Oerlikon train station for around 5 min. 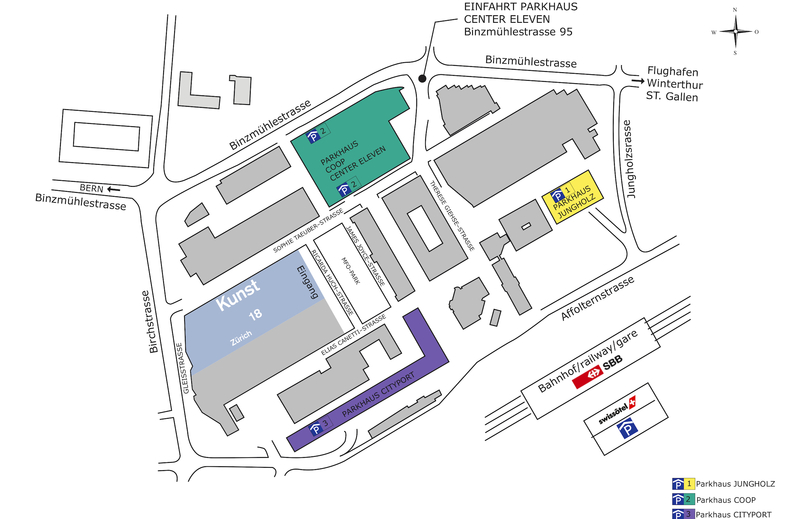 Below you can find the picture of the exhibition location at Oerlikon. Thursday, Vernissage, 4 p.m. to 10 p.m.
Friday, 12 p.m. to 8 p.m.
Saturday – Sunday, 11 a.m. to 7 p.m.
Day pass Friday, Saturday, Sunday – 30 CHF. You will find a couple of bars around the exhibition in addition to a cosy restaurant at the end of the exhibition hall. Also, there is a cloakroom, cash only – 2 CHF. As usual, more info about the fair you can find on the Kunst 18 Zürich official website. This year, the SIMYO gallery from Seoul displays a selection of contemporary, exclusively Korean artists. It shows their dialogue with traditional, classical painting including works of Miindo, Velasquez and some ants (2011) by Lee Nam Lee. In the area of graphics, the print PIZ NAIR (negative) (2018) by the exceptional artist Not Vital from Engadine stands out, presenting his work at EDITION VFO as the leading publisher of high-quality, contemporary print graphics. Arte Giani shows the work of the winner of the 1992 Ingeborg Bachmann Prize, Alissa Walser, with her multi-part, inter-related sequence of images (2017). 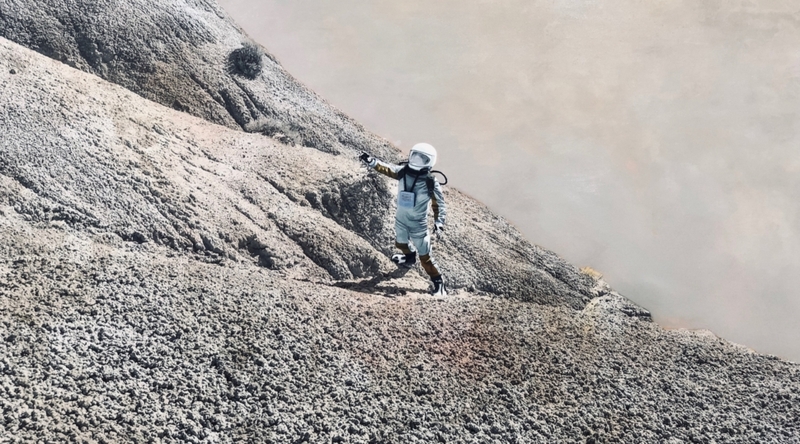 The BEWE Foundation from Basel presents Sebastian Haas. In his installation Total (2018), a reverse glass painting technique was applied. Hence, allowing the viewer a variety of perceptual dimensions. A highlight of kunst 18 Zürich is the special exhibition by Zero-Movement-icon Lucio Fontana, called Beyond Space, curated and designed by Galerie Imago. The Frankfurt gallery Greulich dedicates its stand to the new bronze works by Tjark Ihmels, in addition to a new work Unpacking Ego by Casey McKee, who paints the foreground with oil on top of a photo-print, in oder to bring out the desired expression in his works. The Lucerne Gallery Hilfiker Kunstprojekte presents Martina Böttiger. With her imposing linocut If I knew where that is, I would go home (Anne Berensford, Homesick) (2018). Above all, the artist is an excellent example of continuing the gallery’s favorite subject of interiors, urban and architectural views. Kaminska & Stocker, remain faithful to their gallery program of last year. It continues with the artist Alina Mnatsakanian Nocturne (2016) and her favorite subject of volumes in space. Gallery Alex Schlesinger focuses on contemporary painting in the area of tension between abstraction and objectivity. The main themes of urban life and architecture, this year underlined by the artist Corinne Güdemann and her work Vermeer (Rijksmuseum) (2018). I am certain, you would discover something impressive, provocative and fascinating for yourself during this contemporary art fair. Stay tuned on World of Julia for more photos and impressions from Kunst 18 Zürich.